VariPOS 2 Series is the lastest evolution of the Reddot award winning design; taking the series to the next level by extending the range of performance, increasing flexibility and making the new series the most versatile terminals in the market; maintaining the stylish modern aesthetic that makes VariPOS an industry winning design for the Retail & Hospitality markets. 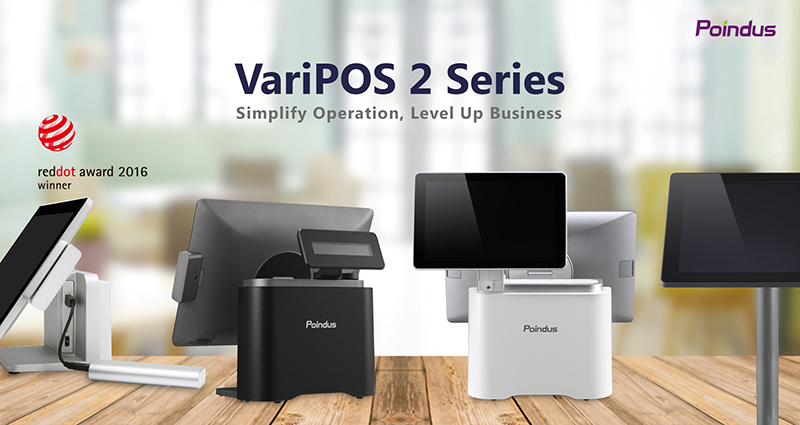 The VariPOS family introduces three new All-In-One POS Management Terminals that have been designed to fit more application scenarios than ever before. The new models offer unique features to meet many more market segment requirements. VariPOS 240 – Energy efficient Intel J1900 CPU is a tried and tested solution for POS terminals, meeting many POS software processing requirements. The 240 combines a 14” PCT 16:9 widescreen and the power & performance of the J1900 in style. VariPOS 250i – Intel 6th Generation fanless architecture combined with a 15” 4:3 Display plus a customizable I/O Box allows system integrators to overcome most project limitations and is the most flexible VariPOS in the range offering a PPC configuration. The Award Winning VariPOS 210 has been revised with improved performance to meet the more demands. VariPOS 210P – Designed for Android POS deployments, the 210P provides a solid base and generous 14” 16:9 widescreen display, offering a classic POS terminal solution to the Android Market. VariPOS 2 Series transforms retail and hospitality environments with a stylish aesthetic and brings a full range of Intel processing power, interchangeable IP66 displays, cross-compatible peripherals and Powered USB. The 10.1” 2nd Display allows optimal positioning with the highly flexible double hinged design. Quick Service modular design simplifies maintenance schedules, significantly reducing the engineering resource and time. Cross compatibility of peripherals across the whole range makes inventory control easy for System Integrators. The new VariPOS Evolution meets your demand whatever the scenario. In 2018 Poindus introduced the latest VariPOS Evolution with a new design ready for retail and hospitality in the 21st Century. Poindus is a leading innovator in POS design and the new VariPOS bring a stylish two piece construction in a slim aesthetic design. The new series introduces three new models to the market.